National Fossil Day is a special observance, that was established to promote the educational and scientific values of fossils. This national event is annually organized on Wednesday in October. The very first National Fossil Day was observed during Earth Science Week in 2010. This special week is annually organized by the American Geosciences Institute since 1998. The event was organized by the national Park Service and over 270 partners, including museums, institutions, organizations and other groups, supported it. Hundreds of activities were organized across the United States, allowing the public to understand and learn more about the fossil heritage. 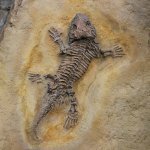 The world's fossil heritage is very important for all of us. Only fossils give us an idea about the past of our planet and extinct creatures. Not all remains can be classified as fossils, because they require a minimum age, most often date of 10,000 years. Every year a new special logo is created to celebrate National Fossil Day. This helps attract public attention to different fossils and share information about it. The new logo is unveiled every year in the mid of January, and it highlights an interesting story related to the fossil record of life.